We aim to understand the practices of our suppliers who supply raw materials to our eight downstream facilities. Specifically, how suppliers procure Fresh Fruit Bunch (FFB) from their plantation sources and how they process them into Crude Palm Oil (CPO) and Palm Kernel (PK). We also aim to understand practices within the plantations our suppliers procure from, including plantations owned by independent smallholders. This helps us in our efforts to transform our supply chain to become more responsible and resilient. To achieve this understanding we began by mapping our supply chain to the mill and we achieved 100% Traceability to the Mill in 2015. This means that we know the locations and relevant details of over 400 palm oil mills (third-party and GAR-owned) that supply CPO and PK to our eight downstream locations. We continue to maintain and update this traceability data quarterly on our Sustainability Dashboard. Now we are focused on extending our knowledge and sustainability outreach efforts to the plantations, smallholders, and dealers supplying FFB to these mills. Launched in 2016 our Traceability to the Plantation (TTP) exercise will provide us with crucial information about the origin of our raw materials, improving our transparency to buyers and customers. 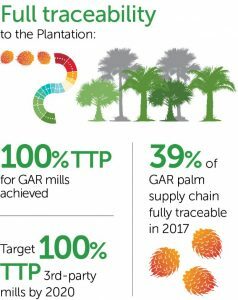 At the end of 2017, we achieved full Traceability to the Plantation (TTP) for all GAR-owned mills. We are now working with over 400 third-party supplier mills to help them complete full TTP by end-2020. Mapping the entire supply chain directly to the plantation enables us to better know the plantation owners, workers, farmers and intermediaries involved in supplying our raw materials. 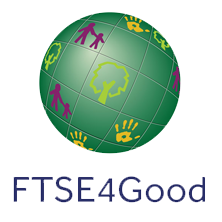 Our aim is to ensure that our entire supply chain is operating in line with our sustainability commitments. To help suppliers do that, we need to learn who and where they are and how they already perform against our requirements. To see the latest mapping and supplier data, visit our Sustainability Dashboard. We work with our suppliers to develop practical action plans to achieve traceability to the plantation. The inclusion of independent farmers and other intermediaries involved in FFB trade is an essential part of this process. In tandem with our traceability efforts we are carrying out systematic assessments of our suppliers. These assessments are site-based and involves assessing their suppliers as well. Our assessments use indicators derived from our commitments in the GAR Social and Environmental Policy (GSEP) and checks our suppliers’ progress towards responsible palm oil. Reports on these assessments can be viewed on our Sustainability Dashboard. Golden Agri-Resources (GAR) supports increased transparency in the palm oil industry and has demonstrated its commitment through investments in traceability to the mill and to the plantation for its own operations and third party suppliers. GAR’s wholly owned and subsidiary concession maps, along with those of peers who are RSPO members, such as Asian Agri, Astra, FELDA, Misim Mas, Sime Darby and Wilmar, have been published via the RSPO on the Global Forest Watch (GFW) map platform. Increasingly the publication of supplier concession maps is being called for as part of that transparency process. GAR’s position on this is clear. Concession maps and boundaries can only be made public if voluntarily done so by the concession holder or land licensee. GAR believes there is benefit in companies choosing to voluntarily publish their maps, whether on shared platforms such as GFW or their own company websites, as this promotes transparency, contributes to supply chain traceability and allows the oil palm industry to demonstrate that it is operating legally. We also respect the right of individual companies to make this decision themselves. GAR works with TFT to compile and verify this information and report on our traceability to plantation progress on the GAR Sustainability Dashboard. We also work with peers in the industry, the Roundtable for Sustainable Palm Oil (RSPO) and the Indonesian Sustainable Palm Oil (ISPO) standard as well as other relevant stakeholders in establishing processes and standards. To further assist our suppliers with the technical aspects of traceability, we are linking them up with technical providers such as GeoTraceability and Koltiva.